As mentioned, Hot Pepper Gourmet free paper can be found every where in town. It’s posted in convenience stores and supermarkets for locals’ dining out information, or posted in rail stations along with town information leaflets for visitors. No surprise even if you find Hot Pepper Gourmet at the entrance of a restaurant and just walk in there with its discount coupon. In this age, no doubt you can find it on the web, too. Thanks to Internet the almighty, Hot Pepper now provides a floods of information. 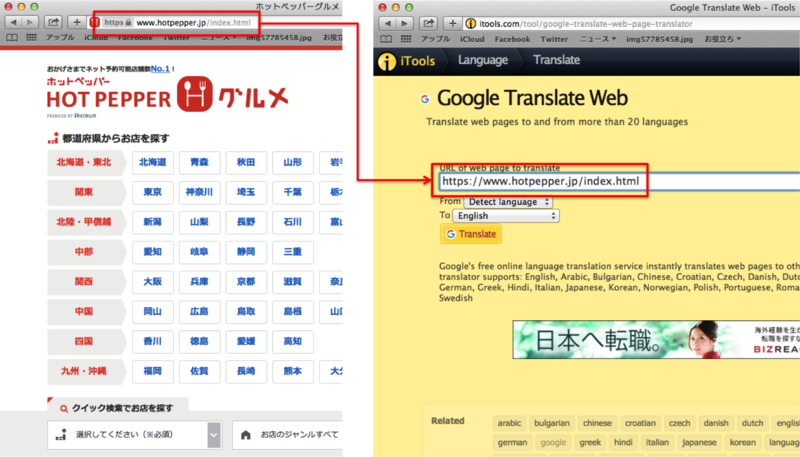 Even so, or rather as suspected, the multi language information is far poor than original Japanese web page. 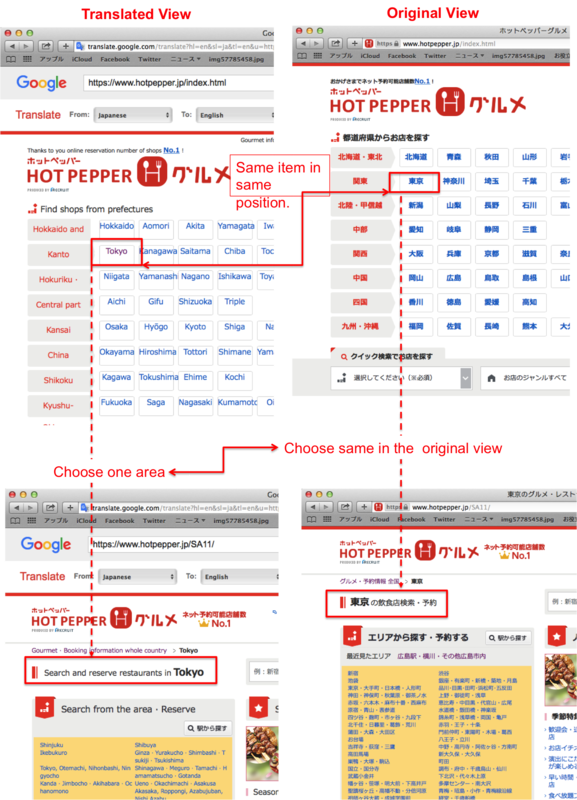 Conditions on using this guide: Please be noted, from here below is guiding and showing based on Hot Pepper Gourmet PC site. Each full sized pictures averagely around 1MB, some of them reach 2MB or above. The guide is totally relying on the Hot Pepper Gourmet it self and google web translator, any trouble occurred by incorrect translation or whatever is not my responsibility. I think you want to see the multi language site at first. 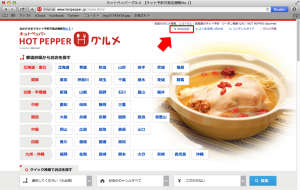 At Hot Pepper Gourmet the original Japanese site, you can select languages from English, Chinese or Korean at the top middle right of the top page. Go find your favourite restaurant and get a coupon what they offer. 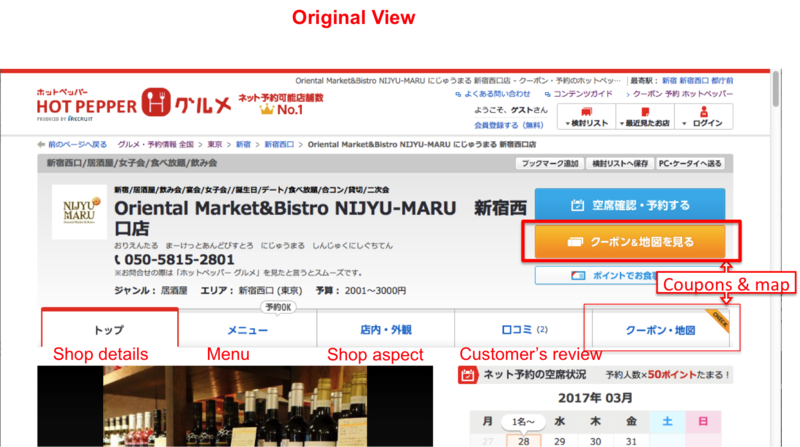 Let’s take an example this restaurant, Oriental Market&Bistro NIJYU-MARU　新宿西口店. << Click to view the restaurant details page. The way to use the coupon is written on it. It is normally described like “Present coupon on smartphone screen when entering the restaurant”. However, there are guests who do not use smartphone during Japan trip. I believe some of the restaurants willingly accept it even if you use the coupon by printed hard copy. 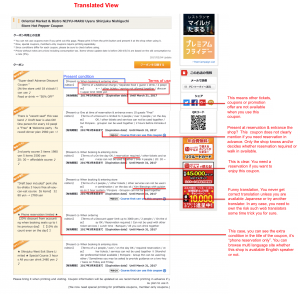 There are lots of attractive points in original Japanese site, but one big point is most of (or all of?) 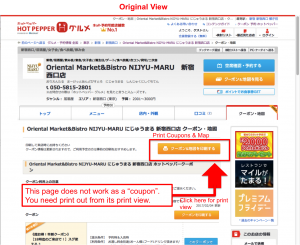 the coupons offered in multi language site are not requesting you to make a reservation. 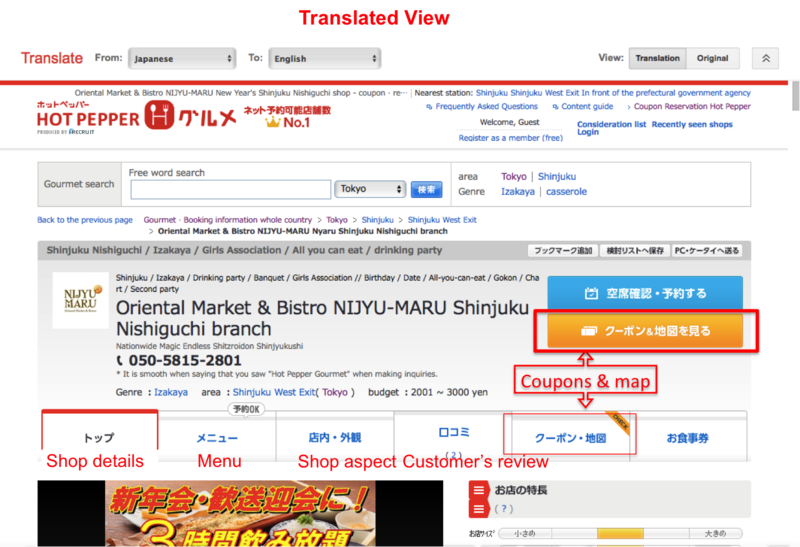 If you don’t want to hassle looking into Japanese site, just use those coupons offered in multi language. 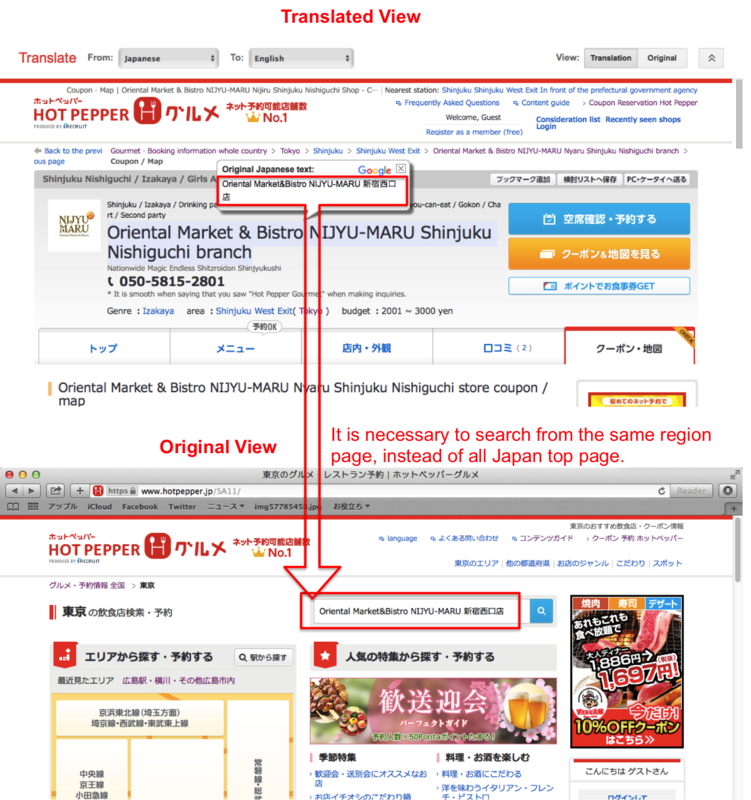 The big differences between Japanese original site(hotpepper.jp) and multi language site(hotpepper-gourmet.com) are. . .
Multi language site does not cover all over Japan, but limited area only. 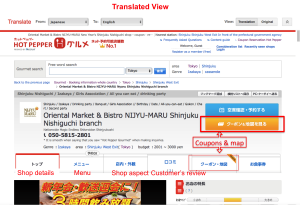 Japanese site provides variety of coupons where as multi language site provides coupons only 2 types, 10% discount or 1 dish free. Only those reasons, you know why I recommend to use original Japanese site of Hot Pepper Gourmet. Here, let me guide you step by step, the way to dig in the Japanese site and get a coupon from there. There is also a feature that you can make reservation through this web site, but you need sign up or communicate with the restaurants. So I prefer focus on “coupons” here. 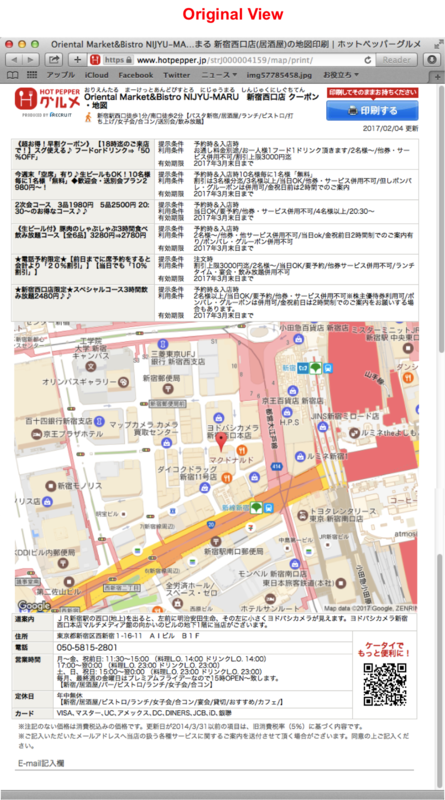 If you want to reserve a seat, please see Gurunavi guide. 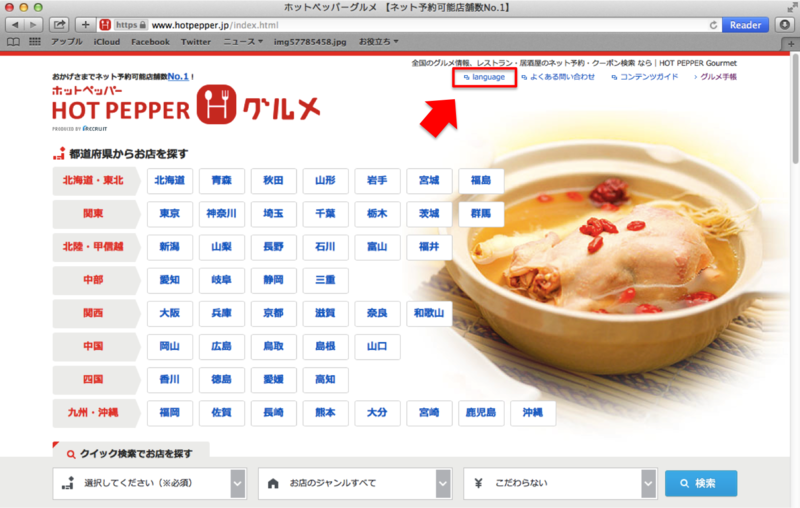 At the top page of Hot Pepper Gourmet you can select which area you want to visit. 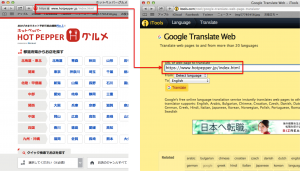 In a separate tab or window, use Google Translate Web – iTools to help you view it in your language. 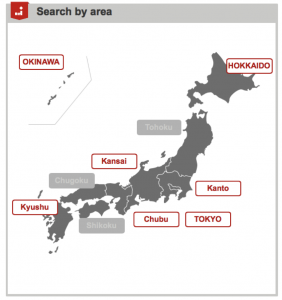 You need to choose one region, Tokyo, Hokkaido, Hiroshima or where ever you are interested in. And for this guide of mine, it is also necessary to leave one Japanese original site in the same region head page. 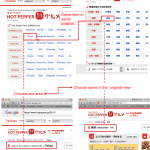 Now, you are able to dig in the Hot Pepper Gourmet original site via Google Translate Web. 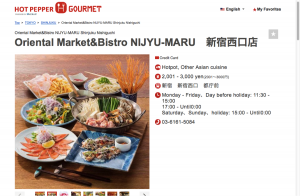 Here let’s assume you found the same restaurant as above multi language site, Google Translate Web suppose to show it as “Oriental Market & Bistro NIJYU-MARU Shinjuku Nishiguchi branch”. << Click to visit the translated web page. You can see the various attractive information here. 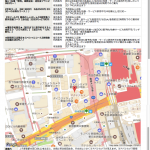 Go click ” クーポン＆地図を見る” for viewing full coupons that this restaurant offers. How do you find the shop offers? Big difference from the multi language site? One thing is,,, that many of those coupons are required reservation in advance. As mentioned, you will be necessary to communicate with the restaurant in order to make a reservation unless you are signed up in Hot Pepper on line. I hope you to find coupons that not required reservation. Now you are viewing the coupons details. I hope you find a good deal for you. 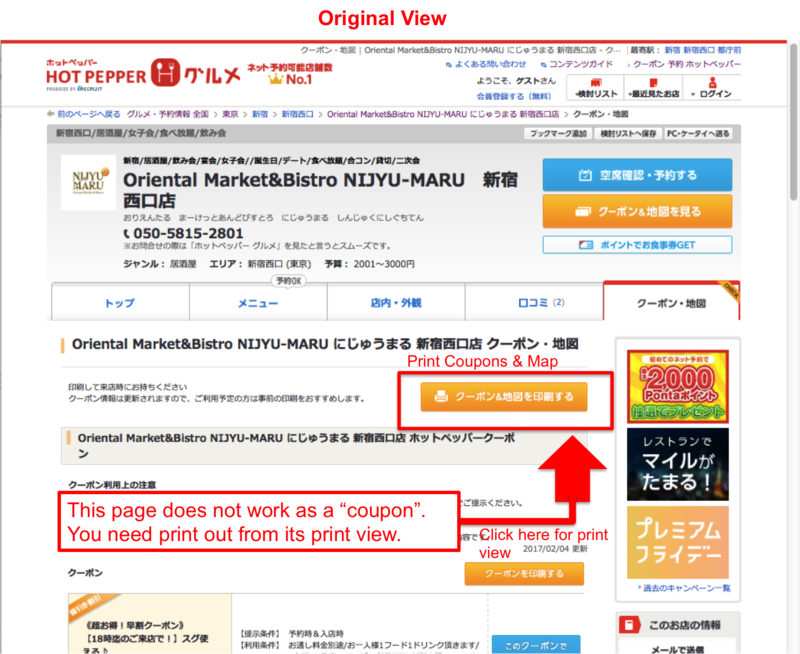 Unfortunately this page you see until here does not work as “coupons” even if in original Japanese page. You need to print it out through its print page. In order to get to the print page, you need to find the Japanese original page with out using Google Translate Web. 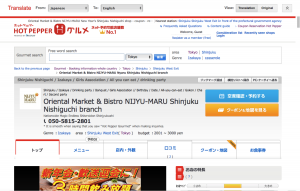 In the translated view, point the cursor onto the restaurant name, it pop’s up the original Japanese text. Copy it and paste in the search word in the regional top page. 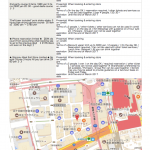 For example above mentioned “Oriental Market & Bistro NIJYU-MARU” is located in Shinjuku, Tokyo. You need to search this from Tokyo head page, not all Japan top page nor other region page. The search word must be 31 characters or less. In case you failed the searching, you may shorten the searching key word, in this case cut some off from the name of the restaurant, and try search it again. Once you get to the restaurant page you are looking for, it is the same to find the coupons page. Click ” クーポン＆地図を見る“. Can you see the printer icon in an yellow button? The button is written ” クーポン＆地図を印刷する” which means Print Coupons & map. Click it. Congratulations! you reached to the real coupons! Print this page out, bring it to Japan and present to the restaurant staff at your visit. After all, the coupon is described all in Japanese. English or other language translated is supposed to be not acceptable but why don’t you print one out for your own reference? At the very least you need to point out which offer you want to enjoy. There are some points you should present the coupon. At the entrance of the restaurant. You may want to check with the restaurant staff if the coupon is still available before you get a seat. Before you make an order. It is possible the shop staff you asked about the coupon at the entrance failed to inform that to the other. Besides, it is good way to go that you tell them clearly like ” I’d like to enjoy this course with this coupon”. When you pay the bill, last check if the coupon price has been applied on it. Well then, I really wish above guid is useful for you. Have enjoyable meal everywhere in Japan! Appetite is one of the biggest thing that brings you satisfaction after all.